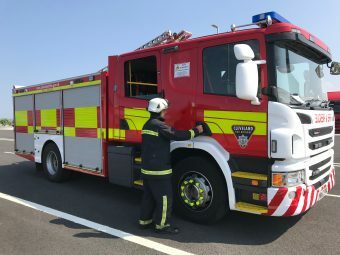 Firefighters tackling a rubbish fire in Middlesbrough have come under attack from youths throwing missiles and damaging equipment. Cleveland’s Chief Fire Officer Ian Hayton has again warned that such behaviour will not be tolerated. Fire engines are fitted with CCTV cameras and footage has been passed onto Cleveland Police. The latest violent incident saw crews having wood and other objects thrown at them, youngsters standing on hoses to prevent the flow of water and opening the rear doors of appliances to try and remove equipment. The youths, while crews were tackling the rubbish fire, also tried to start another fire nearby. It comes after Cleveland Fire Brigade recently fitted firefighters with body cameras in a pilot scheme to help stem the rising number of attacks. Latest figures show a 60% increase in violent attacks on firefighters with more than 100 reported in the last three years.